Peter and Jess from Adelaide, Australia have moved to live in Geneva, Switzerland. This blog is to keep family and friends up to date with their experiences in Europe. Our time living in Geneva has come to an end. We are going to Suva, Fiji, where I have a new job with the ESCAP Pacific Operations Centre. I will be writing about life in Suva at our new blog: www.spacifics.blogspot.com. Our last days in Geneva were extremely hectic, with our things being shipped off, farewells to attend, last minute work to get through, the car to sell and the apartment to clean. Phew! Now it's all over and we are making our way towards the next adventure. Reflecting on our time in Geneva, there are many happy memories. It has been a real journey of discovery. I have learned so much about the world, about statistics and about the mechanics of the UN. I leave Geneva with a sense of achievement and with excitement about the new adventures that life in the Pacific will bring. I also feel a sense of sadness as we said goodbye to a number of close friends and colleagues who have made our time in Geneva really special. We will miss them, but thankfully the internet makes communication so easy, even despite the almost 12 hour time difference between Suva and Europe. As we undertake our 36 hour journey to Adelaide, I am looking forward to spending a couple of weeks with family and friends before heading off to Fiji. A four day long weekend provided the perfect excuse to take some time off and spend a week in Croatia, chasing the summer sun. My Dad is visiting at the moment, so the three of us headed off together last Saturday. 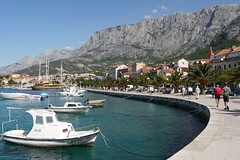 It was the first time that any of us had ever visited Croatia. The Dalmatian coastline is spectacular. We rented a terrific house in the hills above Makarska, a popular tourist town about an hour from Split and two hours from Dubrovnik. We spent the week taking day trips (Dubrovnik and the nearby islands), heading down the hill for a swim at the beach, lounging about on the terrace, reading, playing cards and watching the sunset. One of the highlights for me was our short drive to the nearby Biokovo National Park. I was expecting us to just park the car and go for a short hike in the pine forest, but when we arrived, we found the park consists of the highest mountain road in Croatia: 23kms of terrifyingly narrow, steep road that took us up to the 1,762m mountain peak. It was an incredible drive and I was grateful to complete it without scratching the hire car. In some places, the two-way road was barely wide enough for one car! Well, that may be exaggerating, but it was a challenging and exciting drive. This video of cyclists making the downhill run gives an impression. Overall, I really enjoyed the holiday in Croatia, but for a region that relies upon tourism, they could a better job of some things. The food was disappointing and the tourist information was either non-existent or overwhelming. We wanted to buy a nice momento, but struggled to find anything beyond rows and rows of tourist trash markets. However, the people were lovely and the weather was gorgeous. If you like watersports and don't mind pebbly beaches, it is a very affordable and worthwhile holiday destination. This year's International Statistical Institute (ISI) conference was held in Durban, South Africa, which gave us the perfect excuse to visit this interesting country. After the conference finished on Saturday, we headed off on a tour of South Africa on the Sunday morning. We were only 5 people in our tour group: our good friend and colleague, Petteri; a young newlywed couple from Malta; and us. Our guide was Thabo, a terrific and talkative South African man from Soweto, just outside of Johannesburg. Together we had an excellent time and saw something new and interesting every day. We took a detour on our planned itinerary to visit the hometown of our guide, Thabo. He grew up in Soweto (name derived from South West Township), the township that was built for segregated groups during apartheid. It is home to around 65% of Johannesburg's residents, probably about 7 million people. This, our last day in South Africa, was one of the highlights of the tour. We visited Nelson Mandela's house (8115 Orlando East), the 1976 uprising musuem and the house of Thabo's mother and family. My work has given me the opportunity to visit many countries over the last few years and 2009 has been no exception. So far this year I've been to Ghana, Portugal, Bosnia & Herzegovina, Serbia, Poland and Kyrgyzstan. Likely destinations in the next six months are Tajikistan, South Africa, Kazakhstan and Macedonia. After a busy three day meeting, I had a weekend to explore Warsaw with Peter and a friend from work. Quite a nice city with an amazing new "old town". The flower markets just down the road from our hotel were a daily treat of colour and perfume. Warsaw was completely destroyed during WWII. The old town (see the buildings behind this group of musicians who were just wandering the streets) was rebuilt to look the same, based on photos and whatever records could be found. An apt location for an art exhibition about tolerance. I had to travel to Lisbon for a meeting in March, accompanied by my favourite bag carrier, Peter. While I was working hard, Peter was touring the Portuguese countryside. He went to some picturesque towns north of Lisbon and even enjoyed a stroll on the beach. In the evenings we dined out together, including a lovely dinner with my colleagues and a few Fado singers. We visited Tunis, the capital of Tunisia, back in February of this year. It was our first trip to North Africa. We stayed in the centre and spent Saturday afternoon exploring the Medina. Not much shopping, but Peter got a nice haircut for about AUD$5. On the Sunday we took the train out to Carthage and explored the ancient ruins. Prefer to receive updates automatically by email?